Hi! I’m Caroline. My surname is New, and I’m a new Green. I’ve only been an environmental activist in the last ten years, although I was well aware of the need. In the past I was active as a leftie, and the relationship between the left and the greens has always been uneasy. 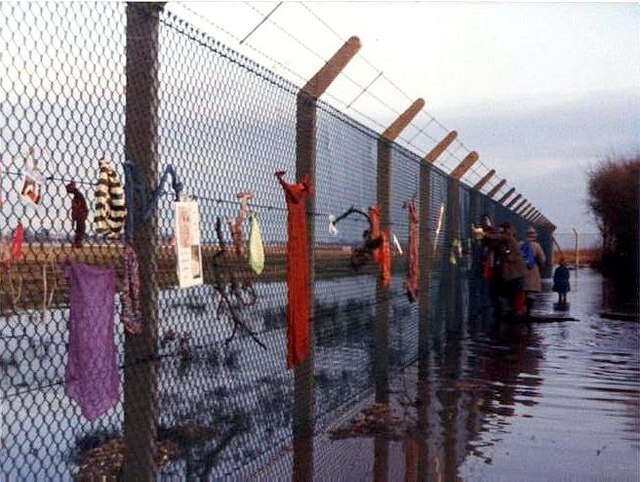 Greenham: Women hung children’s drawings and bits of cloth on the fence. I’m also old rather than ‘new’, seventy two, a year older than Trump. Many political struggles seem to be between members of my generation; the generation which will be least affected by the choices made. This is my convoluted path to environmental activism. I was in CND as a kid, picketing the US consulate in Cardiff during the Cuban missile crisis, looking up at the sky to see if the bombs had dropped yet. I was a Marxist-Leninist (Maoist) in the seventies. I’ve written a novel about that, ‘China’s Daughter’, as yet unpublished. I was a socialist feminist in the women’s movement, and a regular visitor to Greenham. I remember the double, sometimes triple, barbed wire fences, the men and vehicles moving purposefully inside the fence, the weapon silos looming out of the asphalt and mud desert like dead hills, the women doing ‘womanly’ things (building benders, cooking over fires, chanting protests) outside the fence. In the early 80s I was a childcare activist, and with my friend Miriam David wrote a book called ‘For the Children’s Sake’, subtitled ‘Making Childcare more than Women’s Business’. During the anti-Poll Tax campaign I was a weekly ‘McKenzie friend’ (helper) in the courts for people called up for non payment. The idea was to spin proceedings out to make it too expensive to collect this unfair tax. I collected a lot of anti-poll tax objects and tapes from the courts, which you can find in the People’s History museum in Manchester. 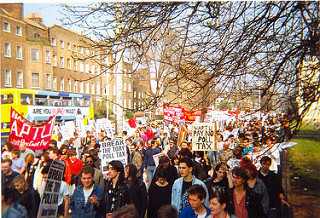 Then for fifteen years I was chair of my Trade Union branch (NATFHE, which was a union for lecturers in UK colleges and universities). That was a lesson and a half in varieties of sexism. I’ve jumped around a bit, but it’s given me a particular perspective that may be useful. Age is like a disguise welded onto your face and body against your will. People look at the mask and often they don’t see you. I wave, and that sometimes works. I am planning for ten years of active life, then I’ll review the situation. I may not get it, but I’m planning for it. During those ten years, or however long I can manage, I want to do something towards us humans having a future at all, and one that’s fairer and better in human terms. I think that means opposing inequality and oppression, and thinking up and putting in place other ways of organising human life. Obviously that must mean joining with others. There are many useful forms of activism, but only 24 hours in the day. When I came (belatedly) to realise the urgency of climate change, I decided to work in the Green Party. The other organisation I’m involved in is Re-evaluation Counselling and it’s environmental organisation, Sustaining All Life. I also have a time-consuming hobby, loosely connected to climate change activism: I am writing another novel, this one a ‘darkly humorous’ dystopia about an eco-fascist regime post-apocalypse. What I like about the Green Party. Most of the campaigns and groups I was in before I joined the Green Party didn’t seem to expect to succeed. They had a somewhat grim or tragic air. One of my memories of being a teenager is of carrying a lime green poster saying ‘H Bombs mean Mass Murder’. I must have been terrified. I remember thinking ‘At least it won’t be my fault’. I’m no longer interested in whose fault it is or was, though often it is all too clear, and as a white British person I usually find myself part of the historical problem. But I’m not interested in blame, I’m interested in successful change. And, perhaps strangely, perhaps implausibly, the Green Party actually believes we can do it. I love that. There are also difficult things about the GP from my point of view, but so what? Join my adventures. Tell us about yours.